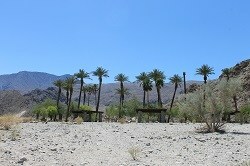 The Oasis at the top of the La Quinta Cove. La Quinta Cove is a bustling, family neighborhood that nestles in one of the most beautiful Coves in all of the desert. The Cove is a non-gated community that offers an alternative to the golf course communities that make up such a large part of La Quinta. Surrounded by the gorgeous, purple Santa Rosa Mountains, the cove is also encircled by a 7.2 mile bike path. Used by local Triathletes to train as well as locals who love to take walks, ride their bikes, roller skate, skate board or hike, the Cove is a very active, out door community. The majority of residents are full time. During the housing boom, there were many beautiful single family homes built and the Cove is one of the fastest selling locations in our beautiful desert. A golf cart ride from Old Town La Quinta with it’s Farmer’s market on Sunday mornings, coffee shop, movies on the lawn, outdoor entertainment, and restaurants, there’s plenty to do! The La Quinta Resort and Club is about ½ mile away on Eisenhower and Interstate 10 is about a 20 minute drive North up Washington. La Quinta’s new civic center, Library, Senior Center, and Fritz Burns’ Park with its lap pool, tennis courts and park like areas are just part of the family amenities offered to residents of the Cove. The La Quinta Cove offers a huge range of single family opportunities. There are no HOAs so any style is ok in the Cove! There are contemporary homes, homes built in 1928, remodels from 1950 to recent custom homes built in 2011. La Quinta Cove is an eclectic collection of architectural styles. There truly is something for everyone. People that like the feel of the La Quinta Cove also tend to like homes located in North La Quinta and The Hideaway Golf Club.